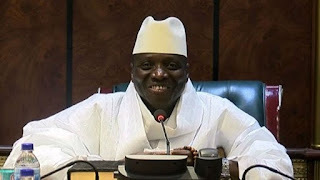 Three victims of a fake AIDS cure created by Gambia’s ex-president sued for damages on Thursday in the first case against Yahya Jammeh to reach national courts since the former leader fled into exile. The three filed a lawsuit at the High Court in the capital of Banjul on Thursday, said US-based charity AIDS-Free World, which helped them gather evidence. Jammeh, whose 22-year rule over the tiny West African country was marked by accusations of human rights abuses, fled to Equatorial Guinea last year after losing an election. Ousman Sowe, Lamin Ceesay and Fatou Jatta were among the first Gambians who joined his HIV/AIDS treatment programme in 2007, where they were forced to give up anti-retroviral drugs and drink home-made potions that made them vomit. Their health worsened, while others in the programme died. “I believe it is my responsibility to hold Jammeh to account,” said Sowe, a former university lecturer in his 60s. People were afraid to criticise the president when he was in power, the victims said, so doctors and patients publicly declared that his medicines were working. The programme hampered real HIV/AIDS work in Gambia, which trails behind other African countries in treatment rates, according to the UN agency UNAIDS. It also worsened stigma against people with HIV and stripped them of dignity, said survivors. Sometimes Jammeh would rub ointment on their bodies in sessions that were broadcast on television, they told the Thomson Reuters Foundation. Afterwards, they lost their jobs and struggled to rent houses since their faces were recognisable, they said. “Jammeh must pay for what he has done to us,” said Ceesay. The victims are seeking financial damages for harm suffered and a declaration that their human rights were violated, said Saramba Kandeh, a legal associate at AIDS-Free World. Jammeh will be tried in absentia and can be represented if he wants, she said. “We want to send a clear message that people living with HIV are people like us,” Kandeh told the Thomson Reuters Foundation. The Gambia-based Institute for Human Rights and Development in Africa and a Gambian attorney are also working on the case.